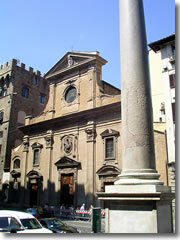 The church of Santa Trìnita in Florence. (Photo by Sailko)This was the first Gothic church in Florence, built in 1250–58, perhaps by Nicola Pisano (but likely by a lesser-known artist), and best-known for the richness of its Renaissance frescoes—especially the courtly works by Domenico Ghirlandaio in the Sassetti Chapel. There's plenty of good art in the chapels along the aisles—including works by Neri di Bicci, Empoli, and especially the fourth chapel on the right aisle, which was frescoed by Lorenzo Monaco. 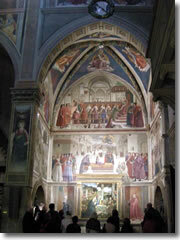 Santa Trìnita's real claim to sightseeing fame is a chapel up in the choir: the Cappella Sassetti. 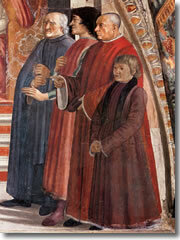 It was frescoed in 1483–85 by Domenico Ghirlandaio (once Michelangelo's fresco teacher). The Sassetti Chapel. (Photo by Sailko)The frescoes are nominally of religious events, but they are populated by parades of contemporary figures (including Lorenzo de' Medici and his kids) dressed in the fashions of the day and set against backdrops that reproduce faithfully the squares and streets of late 15th century Florence—like a window into the Florence of the Renaissance. 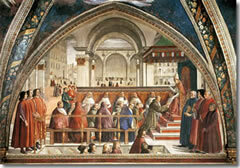 The best example is the painting of St. Francis Receiving the Rule of Orders from Pope Honorius. It was an important moment in church history, as it was the first establishment of a monastic order. Why is it here, though? Because St. Francis was the namesake of the man who commissioned the chapel, Francesco Sassetti. This action—the kneeling friar and his followers, the pope on his throne—is squeezed into the middle distance of the scene—center stage, but flattened as if to de-emphasize the section. It;'s what surrounds the action that's truly interesting. Behind the holy group extends Piazza della Signoria as it appeared in the 1480s, before the Uffizi was built (you can see the walls of the Palazzo Vecchio way back on the left, and the arches of the Loggia de Lanzi in the center). St. Francis Receiving the Rule of Orders It's the foreground of the fresco that's the most fascinating, though, because of its famous portraits. Painting in a portrait of the patron who paid for the job was pretty common in Renaissance art. He usually appeared at the margins of the scene, or sometimes kneeling before the throne of the main saint or Virgin Mary. Ghirlandaio, though, took this practice to an extreme, populating his frescoes with the entire extended families of his patrons, dressed in the latest fashions and finery and mingling as if at a cocktail party with other famous and powerful people of the day. This fresco is no exception. On the right edge of the frame stands, indeed, the patron himself and donor of the money to decorate the chapel: Francesco Sassetti, shaved-headed and wearing a crimson cloak. Next to him stands his young son. To the right of Sassetti, that brutish-faced, dark-haired gentleman in the pale red robes is none other than Lorenzo "The Magnificent" de' Medici, ruler-in-all-but-name of Florence. To Lorenzo's right stands another local notable in blue, Antonio Pucci. Coming up the stairs toward them is the hawk-nosed profile of Agnolo Poliziano—famed poet, humanist, and tutor to Lorenzo de' Medici's children, who are accompanying their teacher up the stairs. The chapel altarpiece, also by Ghirlandaio, has an Adoration of the Shepherds flanked, once again, by the donors: Francesco Sassetti and his wife, Nera Corsi. The Sassetti sarcophagi are also in this chapel, carved from black porphyry by Giuliano da Sangallo. Another of the frescoed scenes in the chapel, The Miracle of the Boy Brought Back to Life (pictured below), features another Florentine street scene. This time, it's Piazza Santa Trìnita itself, just outside this very church (you can see the church facade to the right, with a line of monks being led out of the doors and into the piazza). In the background you can see the old Ponte Santa Trìnita bridge (lined with little shops, as the Ponte Vecchio still is). One element of the current Piazza Santa Trìnita that the fresco doesn't show (but is pictured in the photograph at the top of this page) is obvious as soon as you exit the church: bang in the center of the piazza rises a single column. If it looks out of place, it is. This granite "Column of Justice" actually came from the ancient Baths of Caracalla in Rome, a gift from Pope Pius IV to Duke Cosimo I de' Medici in 1560 (some 75 years after the frescoes were painted). It is topped by a 16th century statue of Justice carved by Tadda of porphyry marble and cloaked in bronze. How long does Chiesa di Santa Trìnita take? Planning your day: Figure on spending may 20–30 minutes in the church. You can attend mass Sundays at 7:30am, 11am, and 6:30pm; Mon–Fri at 7:30am and 6:30pm; Sat at 6:30pm.